Hey, I have some time, so I’m catching up. 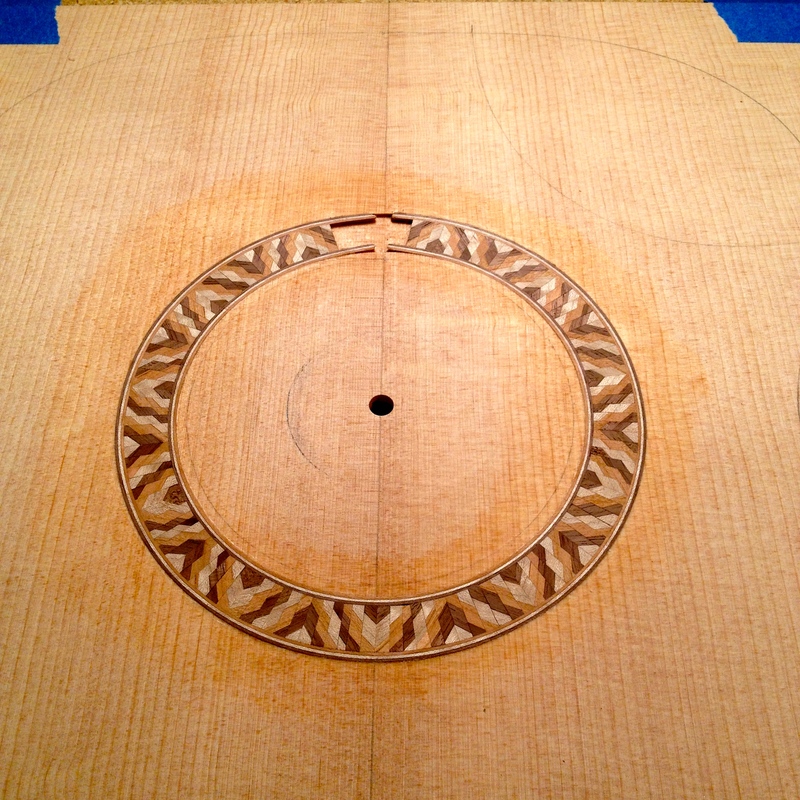 Here is how I made the rosettes for these two guitars. I went with a geometric style. Very similar to my first rosettes. Started with humble beginnings of walnut, cherry and flamed maple. 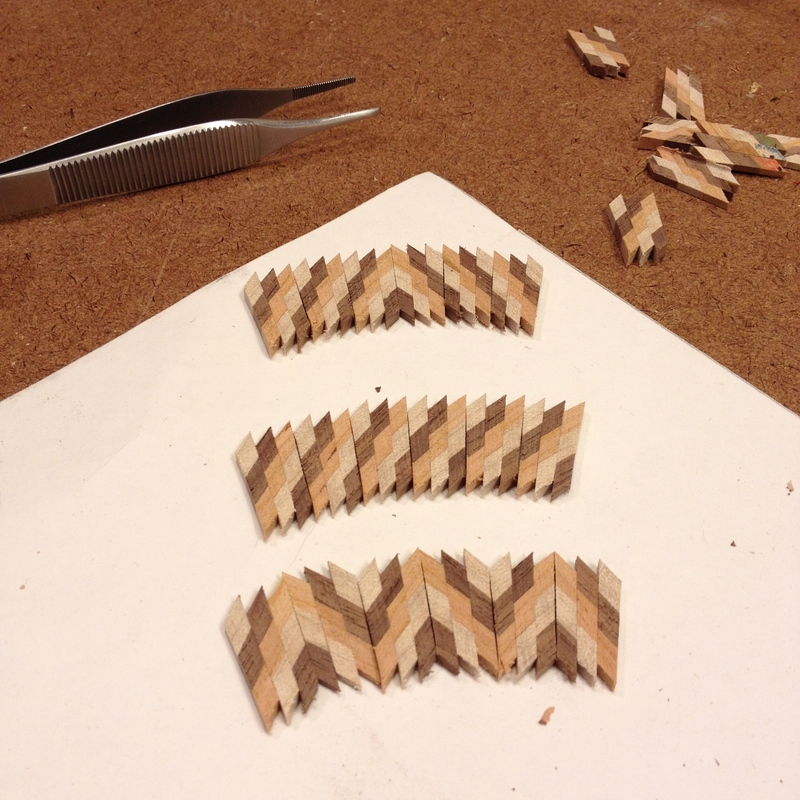 These were glued up as you see here. 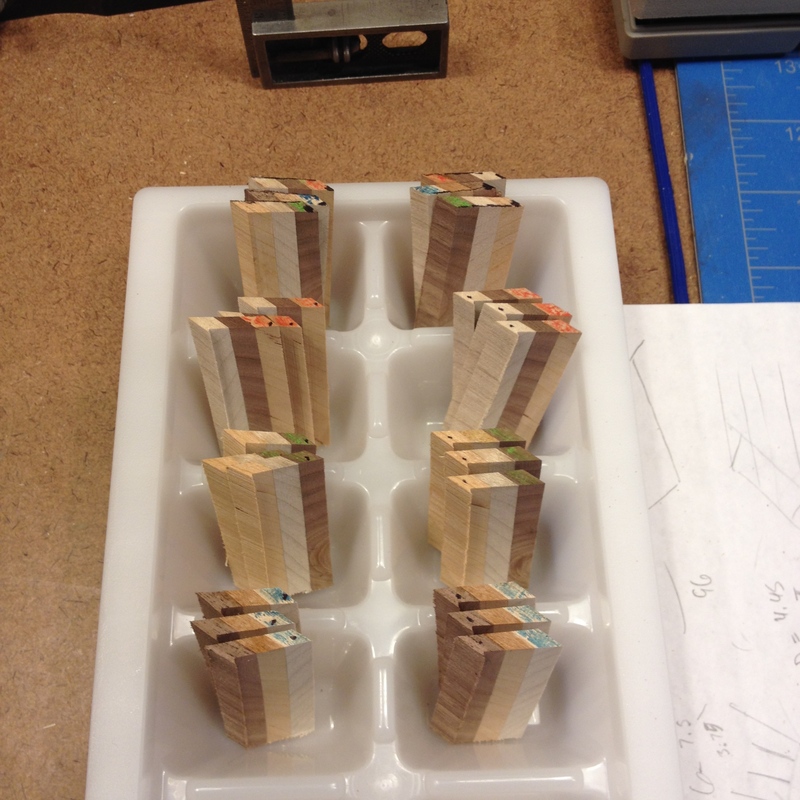 Then I used an incredibly high tech fixture to cut 45 and 42.5 degree angles on each piece. The goal being 7.5 degree segments. 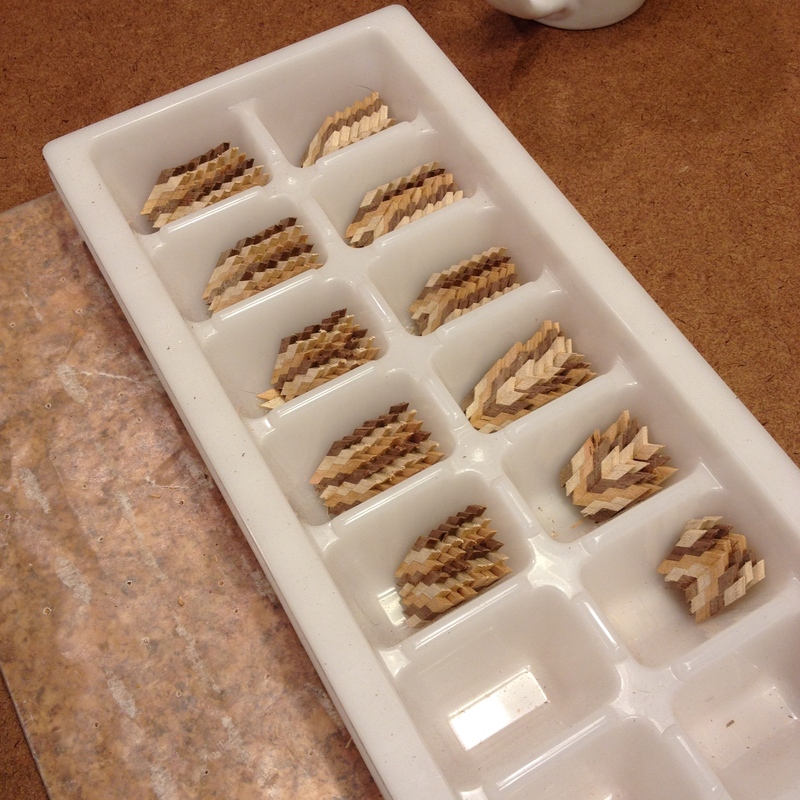 These segments were glued into logs. Notice the “sorting matrix”. This helped keep the pieces separate. 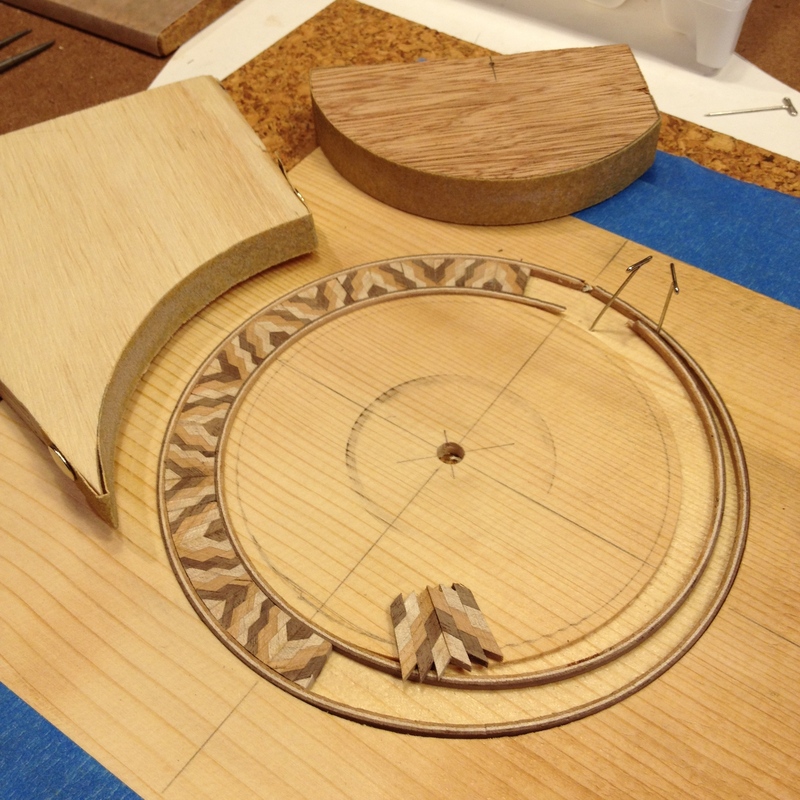 There were three different variations of wood placement and each of those had opposite angles on each side. Then the logs were sliced and sorted. Then I played with some variations of patterns. There were a ton of permutations. I picked two of my favorites. 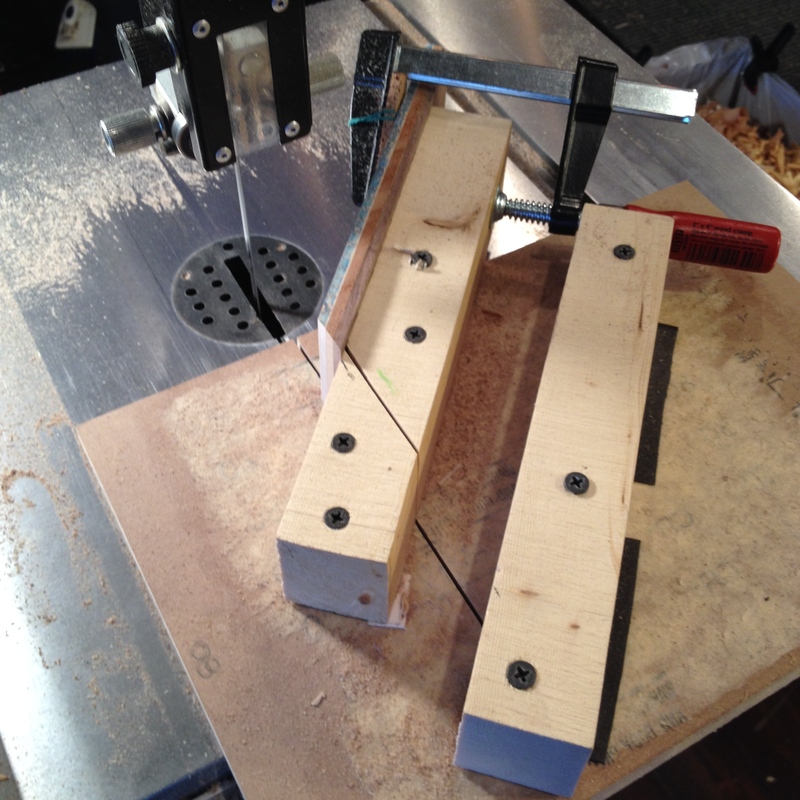 Then I cut a test channel into a piece of scrap and bent up the purflings. Fitting these was very low tech. Cut to approximate size. Inside and outside sanding block to fit. 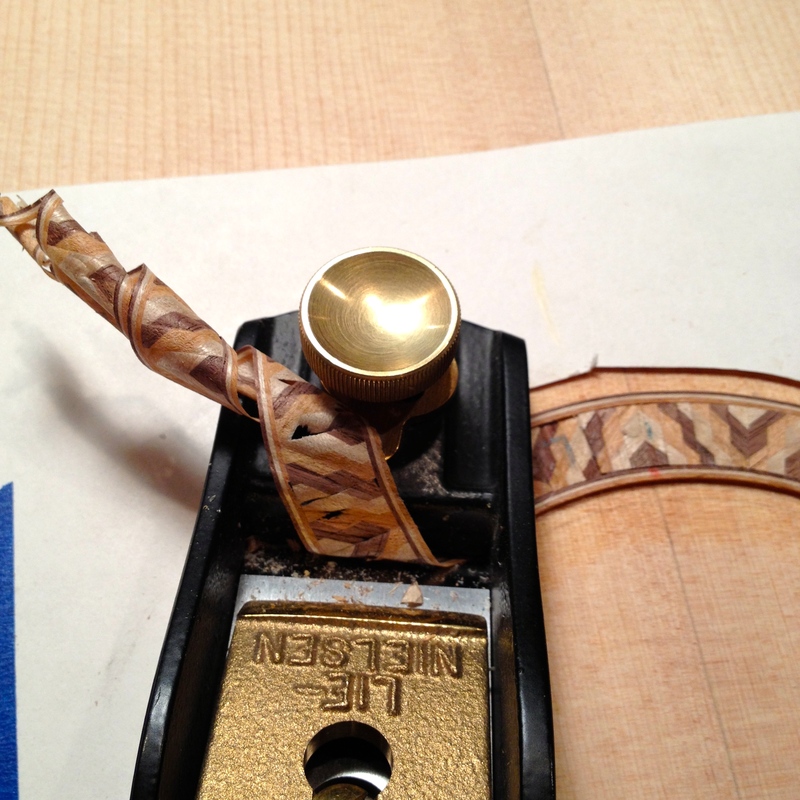 Then I cut the channels into the real tops. 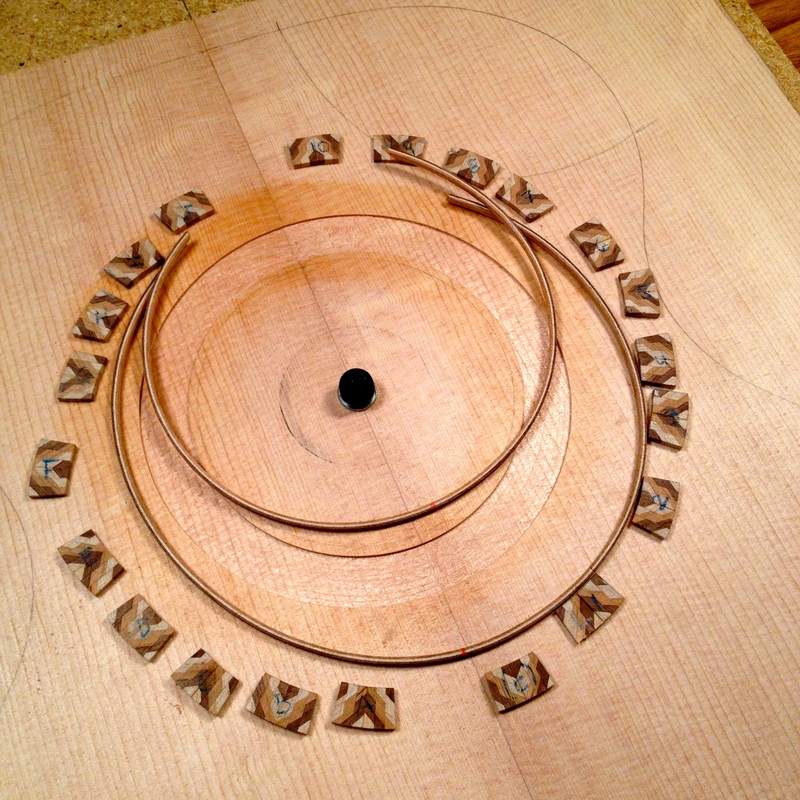 Used a home made circle scribe. 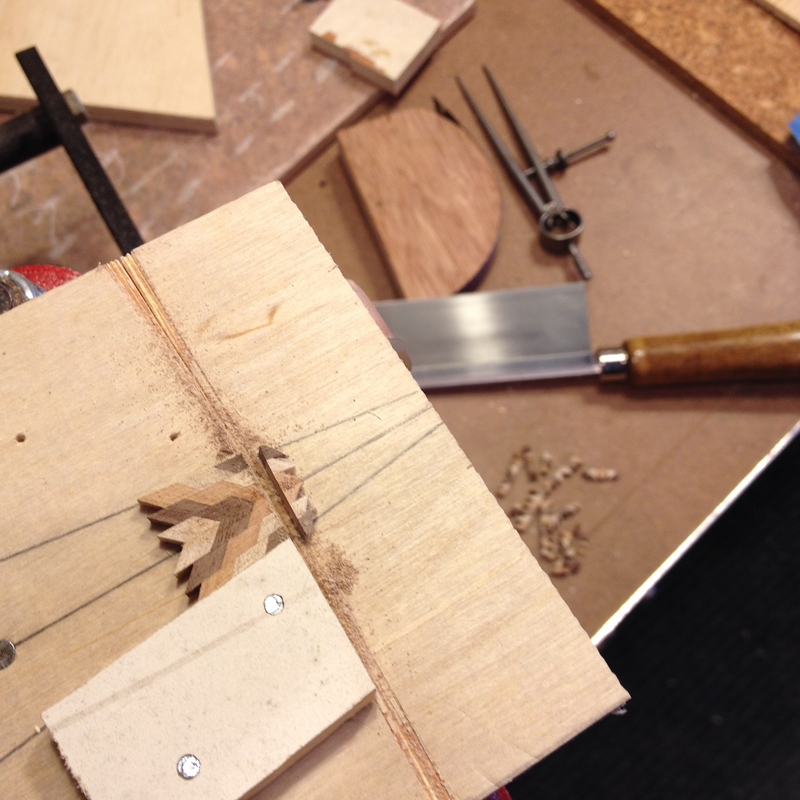 Now that I’ve done at least 12 channels with this scribe (7 for guitars and at least 5 tests), I should really take my time and make a nicer one on a mill. 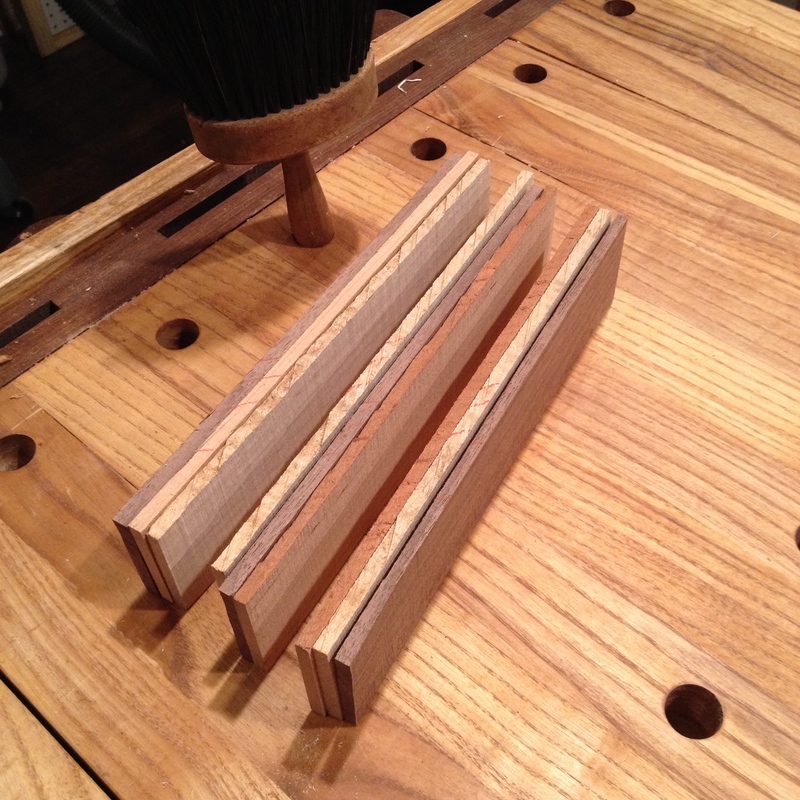 This one was made with a hack saw, files, a drill press, and some taps and dies. The only thing I would add is a dial height adjustment for the blade. I made the blade, a spear point with W1 tool steel that I sharpened, hardened and annealed. 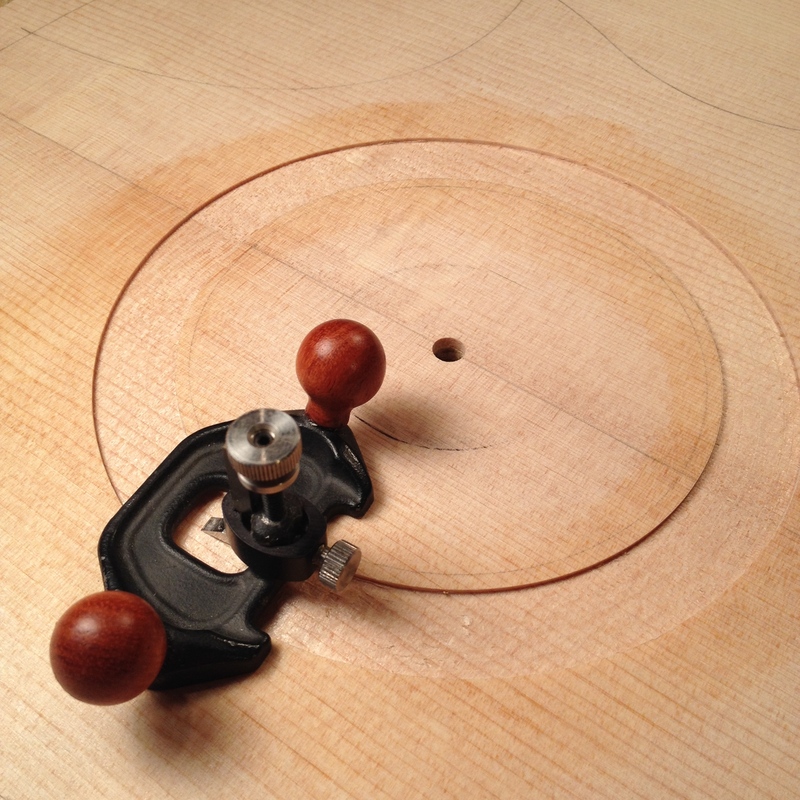 Then a chisel, followed by a mini router plane. These are my 6th and 7th rosettes. I’ve never used a power tool for this. 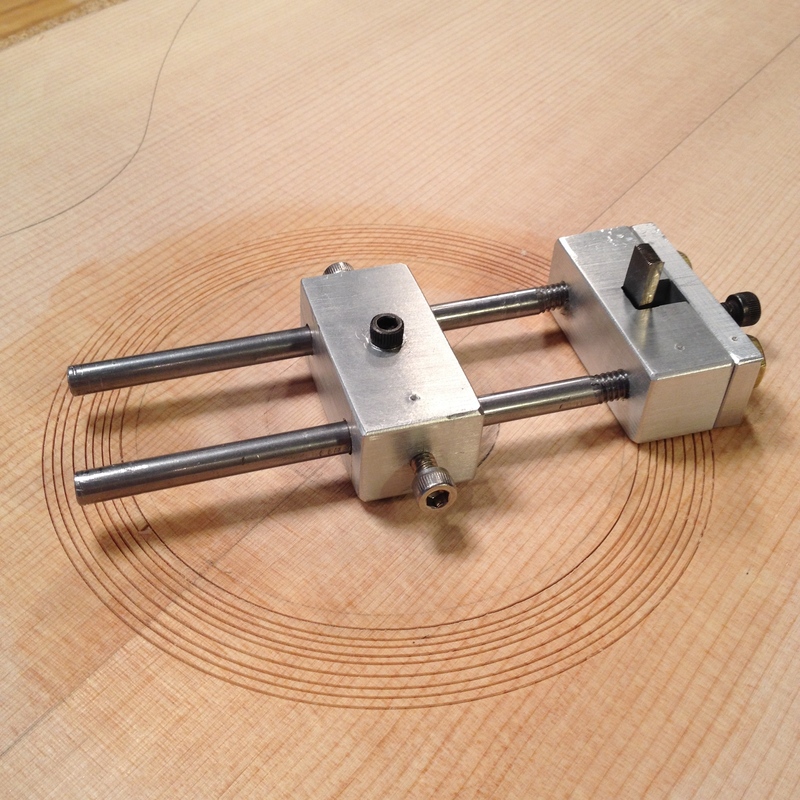 Cutting a .050″ deep, accurate channel, in a .095″ thick piece of soft wood was really intimidating at first. After the first one, I loved it. Its really one of my favorite parts. 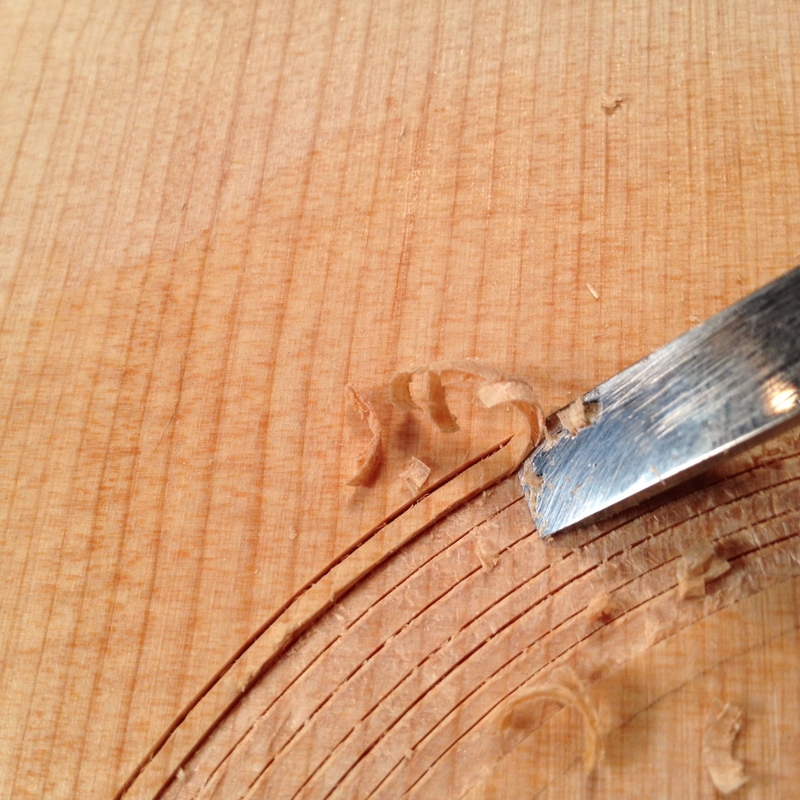 I like the peace and quiet, as well as the clean cuts, when using hand tools. The first rosette ready to install. This is my favorite part. Planing and scraping down after the glue has cured. First rosette done and scraped close to flush. Second rosette installed. 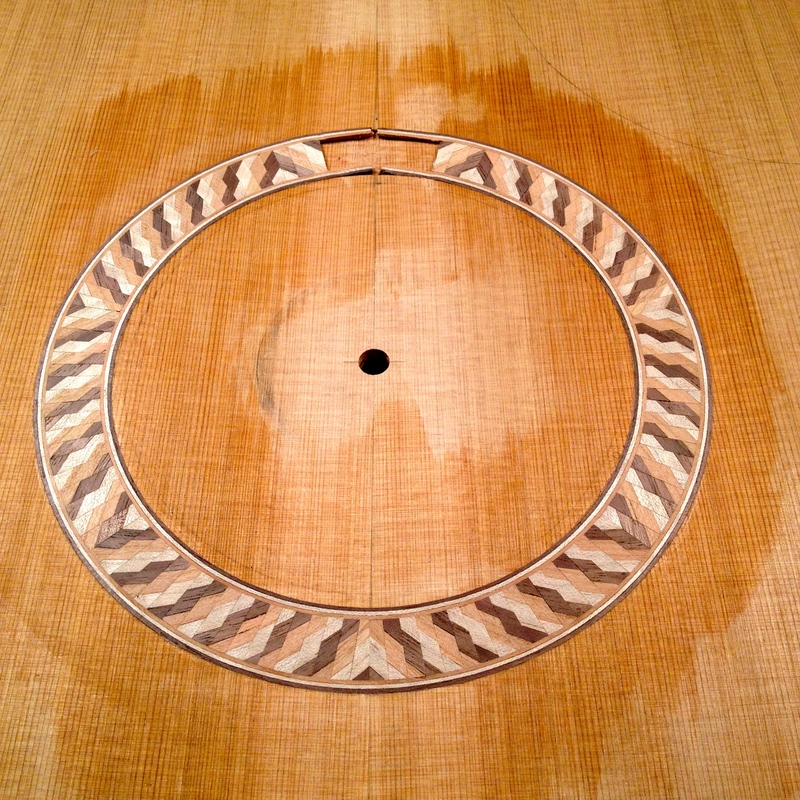 This one in a cedar top. 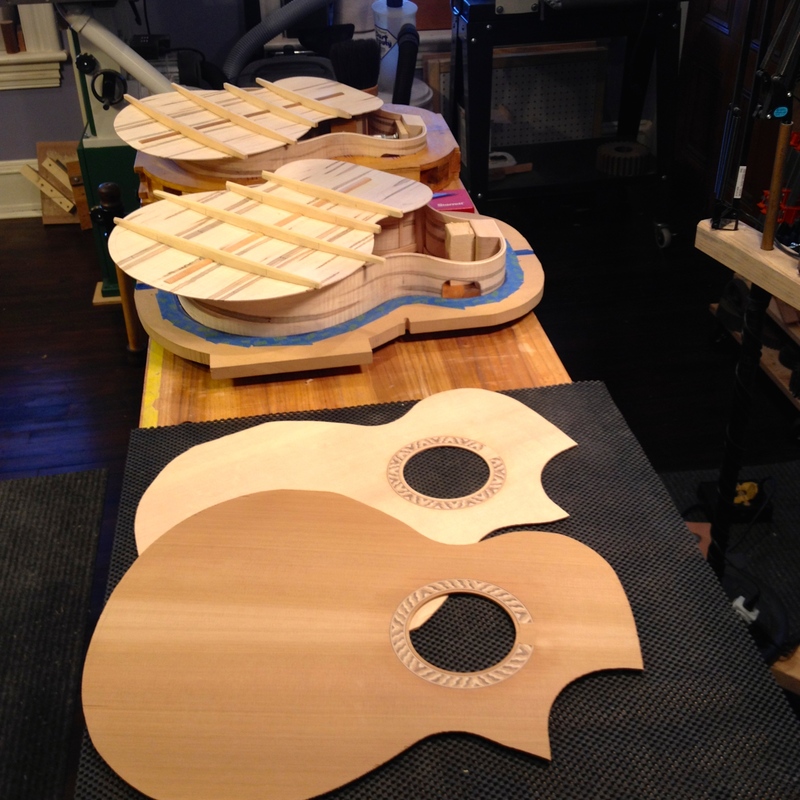 This is where the guitars stood just prior to bracing the tops. Ok. Last two posts almost caught up to where I am now. Should be closing these up soon.